Rose oil is one of the most popular essential oils. It has a rich floral fragrance conjuring up images of romance, luxury and pampering. Rose oil is made from rose petals. As you can imagine it takes a lot of petals to produce a very small amount of oil. Estimates suggest that it may take a ton of petals to produce 300 grams of Rose Oil. Unfortunately the real McCoy is very expensive, however you can buy the more affordable Rose Geranium (also known as Rose-French oil) which seems to work almost as well at one-tenth of the price. It contains many of the same ingredients as Rose – geraniol, linalool and citronellol – and it has similar properties and scent. I use it as a perfume when I'm going out (great for dates) or when I feel tired or agitated. I have found it works extremely well. If I have a meeting that might be stressful or a speaking engagement I put a drop or two on my wrist and sniff my wrist whenever I feel my mood or energy levels drop. 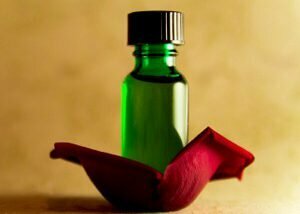 According to Medical Aromatherapist, Tania Cottew, three drops of Rose Geranium oil are equivalent to one drop of Rose Oil for the emotional aspects such as depression – hmmm maybe it's not such a bargain after all! Applying essential oils direct to the skin is not usually recommended, however Rose Geranium does not inflame the skin as other essential oils can. If your skin is sensitive I suggest you place a few drops of the oil on a tissue or hanky and sniff this or pop it in your top pocket. You can also place this by your pillow for an improved night's sleep. Alternatively you can add Rose Geranium to a Carrier Oil such as Almond oil and apply this directly to your skin.